PFI was invented by John Major's Conservative government, but rapidly expanded under Tony Blair's New Labour government. PFIs are essentially contacts given to the private sector to build and operate/maintain infrastructure. The main catch is that these contracts always have extraordinarily high repayment costs, and often other charges attached. Alan Milburn (Secretary of State for Health 1999 to 2003) called PFI the largest hospital-building programme in the history of the NHS . In reality it was the largest hospital closure programme, paid for by major cuts in clinical budgets along with the largest service closure programme in the history of the NHS up to that time. In 1999 Richard Smith, then editor of the British Medical Journal, denounced PFI as Perfidious Financial Idiocy . Of all the financial scams pulled by the Conservatives in 18 years of power - and there were plenty - the Private Finance Initiative was perhaps the most blatant. The bill for PFI constructed hospitals alone is set to rise above £79-billion. The actual cost of building the hospitals was £11.4 billion. The total PFI tab for the taxpayer stands at over £300-billion for infrastructure projects with a capital worth of £54.7-billion. That is enough money siphoned off to the private sector to cover the entire NHS budget for approximately 2 years. PFIs come with strings attached such as restricting maintenance work (which includes changing a plug socket or a light bulb) to only approved contractors. One hospital was charged £52-thousand pounds for a job that should have cost only £750. In addition to maintenance; cleaning, catering, portering, security and the right to franchise retail outlets and car parking services are often included in the PFI contracts for hospitals. PFI wastes massive amounts of a hospital Trust's money on administration costs. Hospital managers need help planning these massive contracts that have a life span of 30 to 60 years. Consequently they are forced to purchase advice from lawyers, accountants and management consultants. These additional costs can be up to 8 percent of the total cost of the PFI project from the point of view of the hospital. The private sector consortium investing in the PFI project along with their sub-contractors also employ lawyers, accountants and management consultants. All these fees can add up to 40 percent to the total cost of a PFI project; most of these costs would not have been incurred under public sector procurement. The fees divert money from the actual cost of building the hospital, so to make PFI projects affordable, new PFI hospitals have fewer beds (typically 30 percent fewer), and other operating costs are slashed resulting in lower standards of cleaning and catering, fewer nurses per patient etc. The real kicker is that in many cases PFI is not even like a hire-purchase agreement. When the contract comes to an end, the private consortium that built the hospital, will still own the hospital. The only possible advantage is that the infrastructure gets built while payment is deferred. So PFI looks more like money borrowed from a loan-shark to pay the rent. It's a scam worthy of any banana-republic. PFI supporters will say that the private investors take on the risks of construction, but in case after case this has been shown to be false. The investors pass the risks onto the construction companies that they sub-contract. This is an important detail, because the consortium have effectively washed their hands of the risk, if something goes wrong the costs fall to the public because the essential services being made dependent upon PFI cannot be allowed to collapse. PFI contracts and the process through which the final deal is negotiated are always opaque. In some cases, even where local union reps have battled for years to invoke their rights to see the finished text of PFI contracts under the Freedom of Information Act, they have been handed only heavily redacted versions, often missing the very sections of most interest to them. A report by the European Services Strategy Unit shows that as many as 270 PFI projects are based offshore avoiding millions in tax. These involve more than 70 NHS projects . The tax loophole to enable this was put in place by the government. This means that money for the health service is first stolen through the mechanism of the PFI contracts themselves, then the corporate structure of the provider opens further opportunities to steal money from the public purse - through tax avoidance - that could otherwise be put back into the health service, or other public services. It's more expensive than public financing. It locks hospital trusts into paying for buildings over 30-60 years in which time needs change radically. It changed local planning from the health needs of local populations to those of private capital. The cost of repayment has to be met out of the operational revenue, meaning smaller hospitals with fewer beds and less staff in order to reduce costs. For example University Hospital of North Durham (UHND) is a PFI hospital costing £97-million. It was built with too few beds to handle local demand. As a result the hospital Trust was forced to divert money to pay surgeons to treat NHS patients in a nearby private hospital to stop waiting lists spiralling out of control. 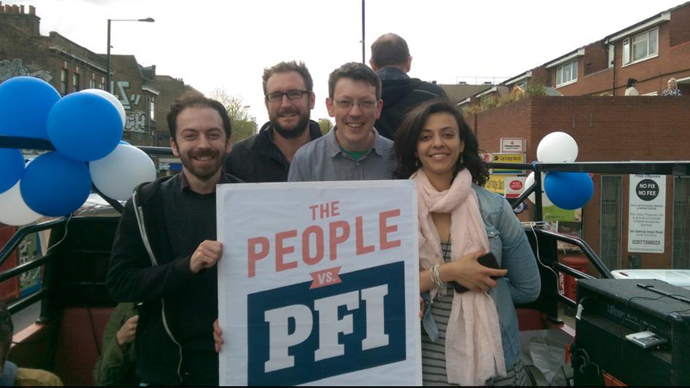 PFI was pioneered in the UK as a way to transfer money from public funds to private capital. The scam has been exported by British companies to countries as far apart as Finland, Canada and South Africa, causing hardship and disruption through its application to hospitals, roads, prisons and waterworks etc. The first PFI scam - the pilot for all other PFI scams since - was the construction of the Sky Bridge in Scotland. The bridge was opened in 1995 and in the same week it opened the government-run ferry service which was free for foot-passengers was stopped. The whole point of PFI is to enable the private investing consortium who are invited to fund the project to make big profits. So in the case of the Sky Bridge this scam took the form of charging a toll for the use of the bridge. The residents of Sky had little choice but to pay the highest toll price per meter of road in the world - in 2000 this was over £5 in each direction for residents, over £11 for tourists and over £15 for public buses. To cut a long story short, the citizens of Lochalsh and Skye formed a protest group called 'Sky Bridge Against Tolls'. The protesters refused to pay the tolls, some went to jail and some were heavily fined. However, they persisted and the toll was finally abolished in 2004. The consortium of private companies responsible for the bridge was given ~£27-million by the government, they had collected ~£33-million in tolls and all for a project that should have cost ~£25-million. This extortion is modest compared to subsequent examples of PFI used within the NHS, but it also shows that we the people can rid ourselves of PFI - and corporate tyranny more generally - if we organise! I can announce that the government will abolish the use of PFI and PF2 for future projects... I remain committed to the use of public/private partnership where it delivers value for the taxpayer and genuinely transfers risk to the private sector. Hammond added that the existing 700 PFI and PFI2 contracts already active will be honoured - stealing hundreds of billions of pounds from the public! 125 NHS PFI projects - valued at £12.4-billion - were signed between 1997 and 2017. These are set to cost almost £81-billion in unitary charge payments by 2014. A plan developed by Labour Party advisers to nationalise the small companies (Special Purpose Vehicles or SPVs) at the centre of many PFI contracts, offers the best hope of bringing these projects into public ownership and control. PFI has become a toxic brand, but future versions of public/private partnerships could not be any less corrupt. As of 2019 Global Health Group at the University of California San Francisco (including former World Bank executive Richard Feachem) is working with management consultants PricewaterhouseCoopers (PwC) in an effort to whitewash PFI and promote a new wave of similar schemes. Anyone can see that the whole point of such partnerships - was, is, and always will be - to open up public sector budgets to create profitable opportunities for construction companies, service providers, banks and finance houses (as well as lawyers, accountants and management consultants like PwC). See Trust Special Administrator for a specific example of PFI leading to hospital failures and closures. See South Shields School for an example of PFI in South Shields. NHS For Sale: Myths, Lies and Deception - Dr Jackie Davis et al.